Mince the garlic and fry with the olive oil in a large frying pan for 2 minutes, until golden. Add the mushrooms and continue to fry until they become golden brown as well. Add the mixture to a food processor and add all the other ingredients for the meatballs except the vital wheat gluten. Pulse until everything broken down but still a little chunky. Add the vital wheat gluten in 2 batches, pulsing until it comes together. It should form a ball of dough once you have added it all. 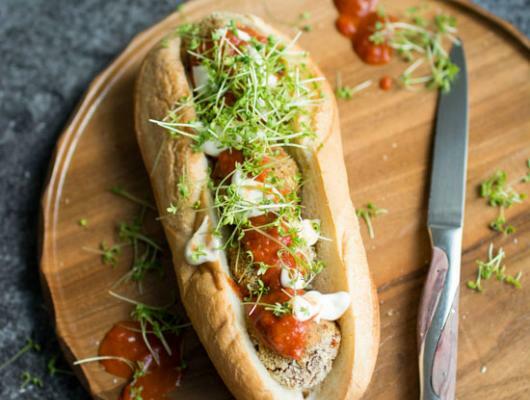 When ready, assemble your sub sandwich with a few meatballs, some arrabbiata sauce, vegan mayonaisse and some greens. 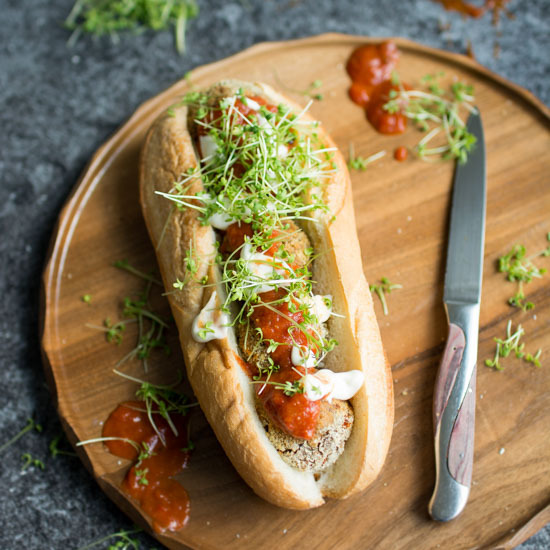 This delicious vegan meatball sub uses mushrooms as a base for a hearty, satisfying sandwich. Meatballs will keep in the fridge in an airtight container for up to 1 week. Reheat in the oven at 180°C for 15 minutes when ready to use.